In-ear earphone market has seen a meteoric rise in the Indian market, mainly attributed to the increase in mobile phone penetration. We have already written few best buying guides on earphones you should check out right now, and with this post, we intend to do a one on one comparison of two most popular in-ear styles earphones in the market – the Sennheiser CX180 and Sony MDR-XB150AP. Without keeping you in wait any more, let’s walk the talk! 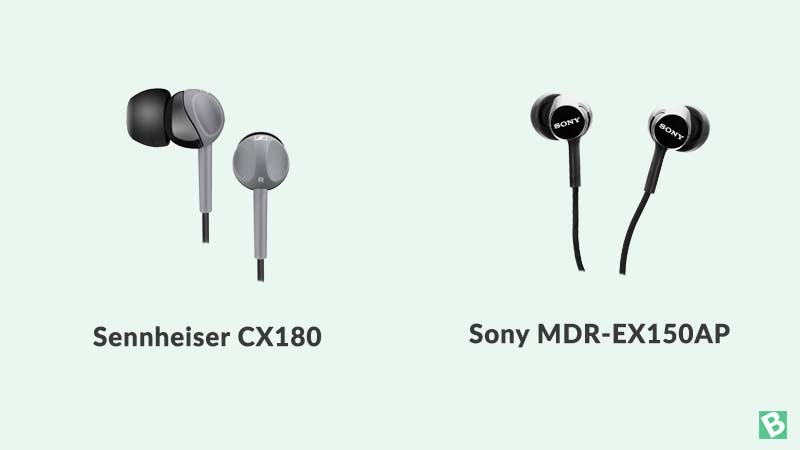 The Sennheiser CX180 and the Sony MDR EX150AP are two in-ear style earphones priced under Rs.1000 in the Indian market. Both of these earphones are very popular and well liked, thanks to its affordable pricing and the excellent sound output. These earphones share a few things in common, yes but we’ll do a comparison between the two, stacking them up against each other. The Sennheiser CX180 features a contoured earphone housing which is made using high-quality polycarbonate plastic. The two-tone colour scheme looks premium, but the wire feels a bit flimsy, to be honest. The Sony MDR EX150AP, on the other hand, comes with a metallic earpiece casing and is available in a multitude of attractive bright colours to choose from. Although it is not a flat style cable, the quality feels a bit better than one on the Sennheiser CX180. Both these earphones do have an angled gold plated 3.5mm pin. Overall, in the build quality department, we would give a tiny edge to the Sony MDR EX150AP over the Sennheiser CX180. The Sony MDR EX150AP has a 9mm neodymium magnet powered speaker driver which covers a frequency response spectrum between 5-24000 Hz. This earphone delivers excellent quality bass sounds and top of the line treble without overpowering the vocals in between. If you are a fan of an overall balanced sound profile with a pinch of enhanced bass, this is it. The Sennheiser CX180 features a 10mm custom tuned driver producing rich bass and pleasant treble in its sound output. The bass is more pronounced than the treble, sometimes overpowering the vocals during the process. If you are an EDM fan, the Sennheiser CX180 will suit you better than Sony MDR EX150AP as well felt the quality of bass is a tad bit rich here. That said, for those who want to know the numbers, the Sennheiser CX180 has a frequency response range of 20-20000 Hz. In a nutshell, for best tonal balance choose Sony and strictly for the best bass, go with the Sennheiser CX180. Both the Sennheiser CX180 and the Sony MDR EX150AP are very lightweight and feels extremely comfortable to wear. However, the secure fitting silicone ear tips of the Sony earphone feels slightly better during extended periods of marathon music listening. This may be strictly subjective and don’t take out word for it. This is one area where the Sony MDR EX150AP beats the Sennheiser CX180 hands down. The Sony MDR EX150AP comes with an inline remote with a single button and a microphone for handsfree calls. This key can be mapped to skip the tracks or adjust the volume with the help of a smart key app for Android which can be downloaded from the play store. The calls quality is decent with minimal distortions and the sensitivity of the microphone is sufficient to pick up your voice even in the remote is not close to your mouth. The Sennheiser CX180 and the Sony MDR EX150AP shows its own might in concerned departments which makes picking a winner between the two is a daunting task. If you want a bass-centric earphone for enjoying genres like EDM and doesn’t mind the absence of an inline microphone, Sennheiser CX180 is a great choice. The Sony MDR EX150AP is for those who want an earphone with tonally balanced sound output together with the handsfree calling facility. Now it’s up to you make your choice and we wish you a rewarding purchase experience. Do keep an eye on our website for more comparison articles about your favourite gadgets, thanks and have a great time!